Less than two years after it opened, Microsoft's studio in Victoria, British Columbia has been closed down. Microsoft opened a small game studio in Victoria, BC, in early 2012, choosing the location for its relative nearness to the company's headquarters in Richmond, Washington, and also for its "livability," which was expected to attract top-quality employees. But yesterday it confirmed that the studio has been closed down. "This was not an easy decision, but one guided by our desire to centralize development in our Vancouver studios," Microsoft told the Times Colonist. "We are working closely with all employees affected by this change to identify open positions in other studios, and we remain committed to doing business in British Columbia." Vancouver is better known as a game development hot-spot, although it's had its share of troubles in recent times too, but TinyMob Games CEO Alex Mendelev said Victoria has a "pretty thriving industry" as well. "I'm sure these guys will find jobs in one of the other 18 companies [in the city]," he said. "They are a very talented bunch of guys, and my understanding is many of them have multiple offers on the table right now. I don't think they will have any trouble finding work in town." 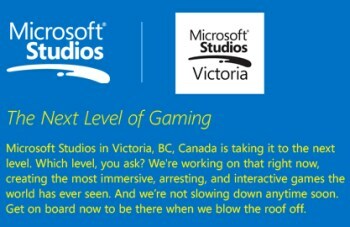 What Microsoft Victoria was working on at the time of its closure wasn't revealed, and the studio's entry on the Microsoft Career site says only that it was "taking it to the next level... creating the most immersive, arresting and interactive games the world has ever seen. And we're not slowing down anytime soon. Get on board now to be there when we blow the roof off." This is probably not the sort of roof-blowing they had in mind, but it's comforting to know (or at least hope with good cause) that most or all employees at the studio will land softly. The report said that at least 30 people were put out of work by the closure.